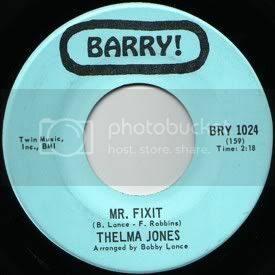 "Mr. Fixit" opens with an organ over a tough groove (dig that metallic-sounding conga), which is the backbone of the tune. Thelma comes in with a straightforward delivery, perfect for the tune, backed by some supporting ladies. A few lines in, the horns appear, and they really seem to flesh it all out. In the chorus, they have a tight little circular line, seeming to perfectly fit in the groove of the tune. Not many soul tunes that I know of have the organ moving throughout them, but it's a nice addition here. Very nice.